All of our fruit is hand-picked at the peak of ripeness and the jam is hand-crafted by us in small batches. Our slow-cooking process with no commercial pectin ensures a deep jammy flavor in each jar. 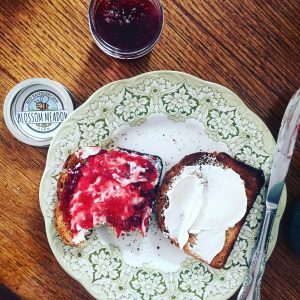 Blossom Meadow Farm jam is great on toast, biscuits, scones or bagels. You can also serve dollops as an hors d’oeuvre with goat cheese, brie, camembert or cream cheese. 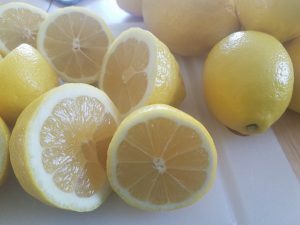 Our recipes are simple because we believe that jam should focus on the natural goodness of the fruit. We use Mason Canning Jars for our jam and many have wondered why we allow for this extra expense. It all boils down to sustainability. Across the United States, municipal recycling programs are no longer accepting glass due to a change in global recycling markets. Our jars are specially tempered to withstand the heat necessary in the home-canning process. 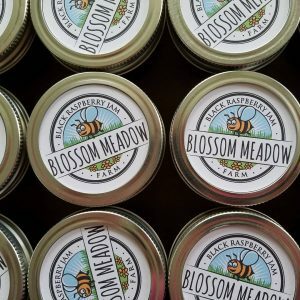 Instead of the landfill, reuse empty Blossom Meadow Farm jars to preserve the bounty of your garden for years to come. Available retail sizes: 4 ounces ($6) and 8 ounces ($12). Please call for the commercial food industry size (32 ounces, $34.50). Please call (631) 905-9780 for bulk orders. BEES! They Need Our Help.